A heat exchanger is a device designed to efficiently transfer or “exchange” heat from one matter to another. When a fluid is used to transfer heat, the fluid could be a liquid, such as water or oil, or could be moving air. The most well known type of heat exchanger is a car radiator. In a radiator, a solution of water and ethylene glycol, also known as antifreeze, transfers heat from the engine to the radiator and then from the radiator to the ambient air flowing through it. This process helps to keep a car’s engine from overheating. Similarly, heat exchangers are designed to remove excess heat from aircraft engines, optics, x-ray tubes, lasers, power supplies, military equipment, and many other types of equipment that require cooling beyond what air-cooled heat sinks can provide. What are heat exchangers used for? You can see heat exchangers in all kinds of places, usually working to heat or cool buildings or helping engines and machines to work more efficiently. Refrigerators and air-conditioners, for example, use heat exchangers in the opposite way from central heating systems: they remove heat from a compartment or room where it’s not wanted and pump it away in a fluid to some other place where it can be dumped out of the way. In power plants or engines, exhaust gases often contain heat that’s heading uselessly away into the open air. That’s a waste of energy and something a heat exchanger can certainly reduce (though not eliminate entirely—some heat is always going to be lost). The way to solve this problem is with heat exchangers positioned inside the exhaust tail pipes or smokestacks. As the hot exhaust gases drift upward, they brush past copper fins with water flowing through them. The water carries the heat away, back into the plant. There, it might be recycled directly, maybe warming the cold gases that feed into the engine or furnace, saving the energy that would otherwise be needed to heat them up. Or it could be put to some other good use, for example, heating an office near the smokestack. In buses, fluid used to cool down the diesel engine is often passed through a heat exchanger and the heat it reclaims is used to warm cold air from outside that is pumped up from the floor of the passenger compartment. That saves the need for having additional, wasteful electric heaters inside the bus. 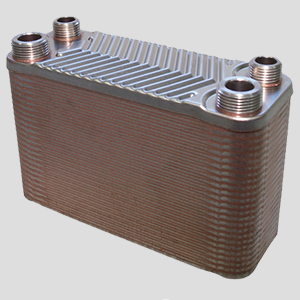 A car radiator is another kind of heat exchanger. Water that cools the engine flows through the radiator, which has lots of parallel, aluminum fins open to the air. As the car drives along, cold air blowing past the radiator removes some of the heat, cooling the water and heating the air and keeping the engine working efficiently. The radiator’s waste heat is used to heat the passenger compartment, just like on a bus. If you have an energy-efficient shower, it might have a heat exchanger installed in the wastewater outlet. As the water drips past your body and down the plug, it runs through the copper coils of a heat exchanger. Meanwhile, cold water that’s feeding into the shower to be heated pumps up past the same coils, not mixing with the dirty water but picking up some of its waste heat and warming slightly—so the shower doesn’t need to heat it so much. The two most common kinds of heat exchanger are the shell-and-tube and plate/fin. In shell and tube heat exchangers, one fluid flows through a set of metal tubes while the second fluid passes through a sealed shell that surrounds them. The two fluids can flow in the same direction (known as parallel flow), in opposite directions (counterflow or counter-current), or at right angles (cross flow). Boilers in steam locomotives work this way. Another type of heat exchanger is a plate/fin heat exchanger, which can provide air-to-air, air-to-liquid, liquid-to-air, or liquid-to-liquid cooling. 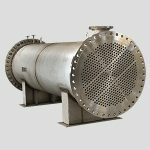 Plate-fin heat exchangers consist of finned chambers separated by flat plates and are circuited in alternating hot and cold fluid passages. Heat is transferred via fins in the passageways, through the separator plate, and into the cold fluid via the separator plate, and into the cold fluid via fin once again. The heat exchanger also has manifold ducting, mounting brackets, and a frame. Heat exchangers used to minimize heat losses from buildings, engines, and machines are sometimes called recuperators or regenerators. These are two quite different things. A recuperator is typically used to capture heat that would otherwise be lost, for example, as stuffy air is ventilated from a building: cold, incoming fluid is channeled in the opposite direction to warm, outgoing fluid to minimize the heat loss. The two fluids flow through separate channels, remain separate, and do not mix. Since incoming and outgoing fluids move in opposite directions, recuperators are examples of counterflow heat exchangers. The heat exchanger in a heat-recovery ventilation (HRV) system is an everyday example of a recuperator. A regenerator is similar, but the incoming and outgoing fluids move through the same channel in opposite directions and at different times. So the warm fluid will flow out through the regenerator, giving up some of its heat on the way. Later, the cold fluid will flow in through the same channel, back through the regenerator, picking up some of the heat stored there. A regenerator is one of the key parts in a highly efficient form of power called a Stirling engine, in which a piston pushes trapped gas back and forth between a heat source (such as a fire) and a place where the heat is lost (“a sink”). The regenerator reduces the heat that would otherwise be lost as the engine cycles back and forth. There are various types of heat exchangers. Heat exchangers provide air-to-liquid cooling, liquid-to-air cooling, liquid-to-liquid cooling, or air-to-air cooling. With air-to-liquid cooling, heat is transferred from the air to a liquid. One example of air-to-liquid cooling is cabinet cooling. With liquid-to-air cooling, the heat is transferred from the liquid to the air. This type of cooling is generally used to cool process fluids. Liquid-to-liquid cooling is also used to cool process fluids, but the heat is removed by another liquid instead of by air. Lastly, with air-to-air cooling, heat is transferred from one air or gas stream to another. The thermal performance of heat exchanger technologies can vary quite a bit, so when selecting a heat exchanger it’s important to understand what performance is needed as well as what fluids are available for removal of heat. It’s also important to evaluate the entire system when deciding on a heat exchanger, as there are a number of considerations including flow rate, pressure drop, materials compatibility, and more.